A 21 year-old Gisborne boy, Thomas Kini, is a member of the Maori "Hi Quins", a sister group to the highly successful Maori "Hi Fives". Lead guitarist for the group, which performs both instrumental and vocal items, Thomas is a brother of Martin Kini and Barney Taihuka of local "Kini Quartet" fame. 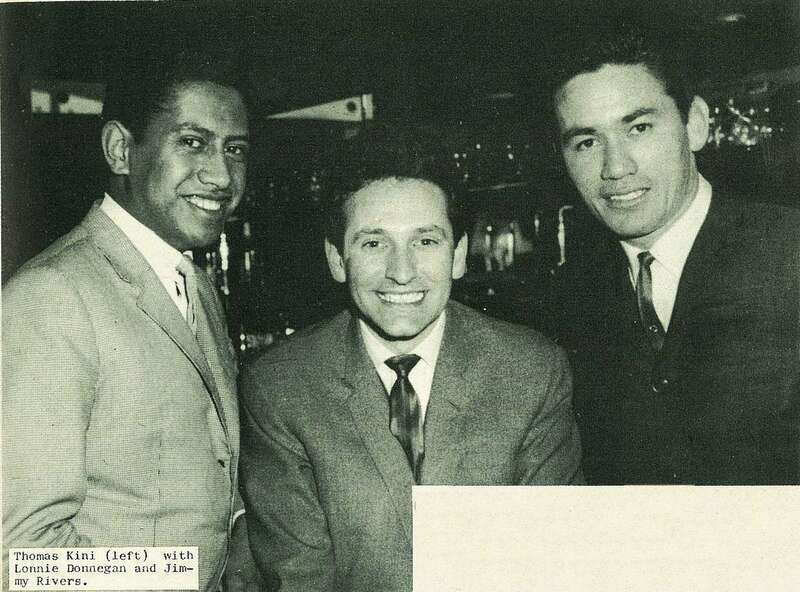 Started in 1960 by Jimmy Rivers, the group worked in Wellington for three months before travelling to Surfers Paradise for an engagement at the Chevron Hotel. Since then, they have not looked back. So successful were they on their first overseas engagement, that they remained at the Chevron for two years. 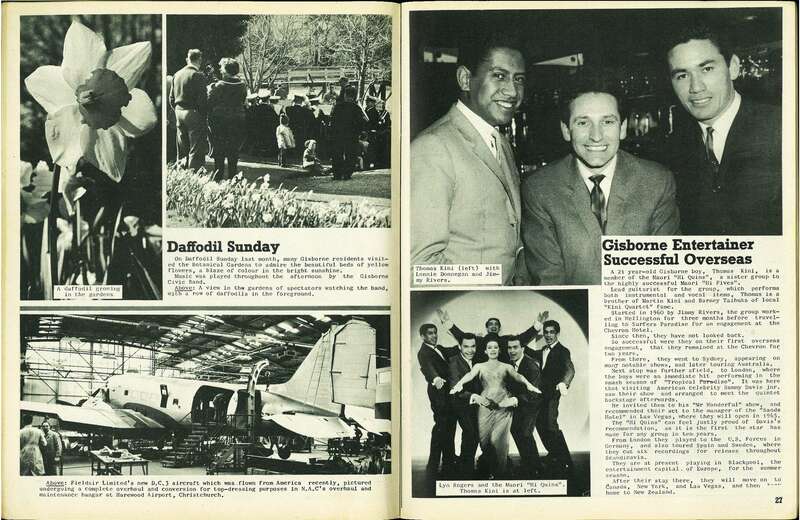 From there, they went to Sydney, appearing on many notable shows, and later touring Australia. 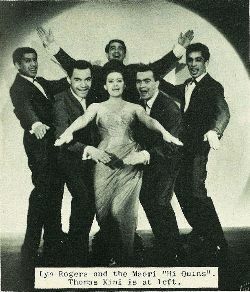 Next stop was further afield, to London, where the boys were an immediate hit performing in the smash season of "Tropical Paradise". It was here that visiting American celebrity Sammy Davis jnr. saw their show and arranged to meet the quintet backstage afterwards. He invited them to his "Mr Wonderful" show, and recommended their act to the manager or the "Sands Hotel" in Las Vegas, where they will open in 1965. The "Hi Quins" can feel justly proud of Davis's recommendation, as it is the first the star has made for any group in ten years. From London they played to the U.S. 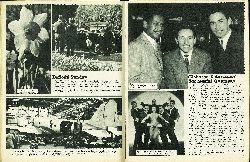 Forces in Germany, and also toured Spain and Sweden, where they cut six recordings for release throughout Scandinavia. They are at present playing in Blackpool, the entertainment capital of Europe, for the summer season. After their stay there, they will move on to Canada, New York, and Las Vegas, and then back home to New Zealand. 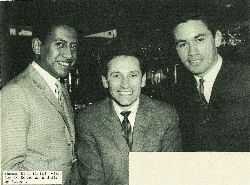 Thomas Kini (left) with Lonnie Donnegan and Jimmy Rivers. 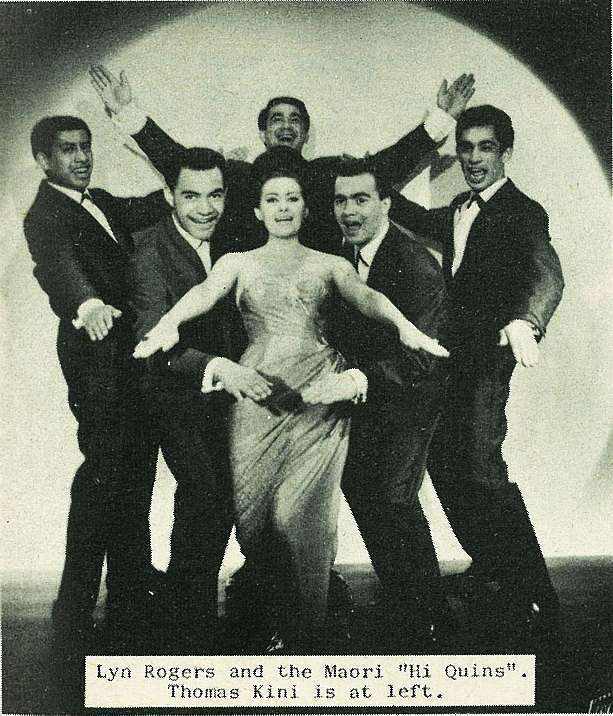 Lyn Rogers and the Maori "Hi Quins". Thomas Kini is at left.